A handful of communities avoid prison gerrymandering and redistricting. We’ve been monitoring how counties and municipalities across the nation have addressed prison gerrymandering. We found that the vast majority of communities (over 200) with both a large correctional facility and a district form of government avoided prison gerrymandering. The communities employ different techniques but they all lead to the same result: districts are drawn as if the Census Bureau had not counted the incarcerated population in that community. Some communities adjust the Census figures, some “overpopulate” the district with the prison, and some cut holes in the maps around the prison. 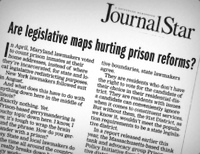 But a handful of communities avoid prison gerrymandering by avoiding redistricting. Communities can comply with the principle of “one person, one vote” without redistricting, if their population has not changed. For example, a city whose population hasn’t changed from one decade to another does not need to redistrict as long as the population within each district also remained equal. Robinson City, Illinois saw population growth in the 2010 Census as a result of annexing the Robinson Correctional Center. The city didn’t redistrict after the 2010 Census, and really doesn’t have to. The total Census population has radically changed, but the resident population is basically the same. The old districts, drawn before the Census allocated the prison to the city, continue to fairly distribute political power to the city’s residents. Post City, Texas had a total population change of 1672 (a 36% increase) between the 2000 and 2010 censuses. But the city didn’t include the incarcerated population at the federal Giles W. Dalby Correctional Institution in its redistricting data when it redrew the city council districts in 2001, so when the prison’s population expanded from 371 in the year 2000 to 1,995 by the 2010 census, Post’s districts remained equally apportioned. The Town of Enfield, Connecticut also excluded the incarcerated populations at the Robinson Correctional Institution, Willard-Cybulski Correctional Institution, and Enfield Correctional Institution when it redistricted in 2010. Then after the 2010 Census, Enfield concluded that there was no significant population change and did not redistrict. Karnes City, Texas had a 12% change in total population reported by the Census, but most of that was due to a decrease in the incarcerated population at the Karnes County Correctional Center. Not counting the incarnated population, the town only lost 196 actual residents. Pike County, Missouri kept their district lines the same when the 2010 Census revealed little change in population. 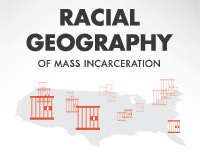 The County’s districts remain unskewed by the prison population at Missouri’s Northeast Correction Center. So while these communities technically didn’t redistrict after the 2010 Census, they have rejected the Census Bureau’s prison counts and avoided prison gerrymandering. City of Youngstown, Ohio, is poised to finally redistrict their 30-year old wards and avoid prison gerrymandering while they’re at it. Unintended consequence: an Oklahoma city’s new charter may require prison-based gerrymandering. Or does it? These cities saved some money, too!